I LOVE the smell of new, freshly cut lumber….It reminds me of my dad. He was always working on some kind of home project and he was good at everything. He inspired this project, in part, because he truly believed he could do anything. Let me first start off by saying that constructing a new fence is actually easier than you may think (not to discount the hard work of the experts). When deciding whether or not to hire a professional landscaping company, it solely came down to cost. We estimated that by using individual pickets instead of the pre-assembled fence panels and soliciting the help of some very, VERY loyal friends, we could save roughly $400.00 in doing the project ourselves. We started out with a plan. We wanted to tear down the center fence that divided the right side of the yard from the driveway on the left. We also wanted to extend the fence on the left side of the garage to connect with the fence that was attached to the back of the garage. 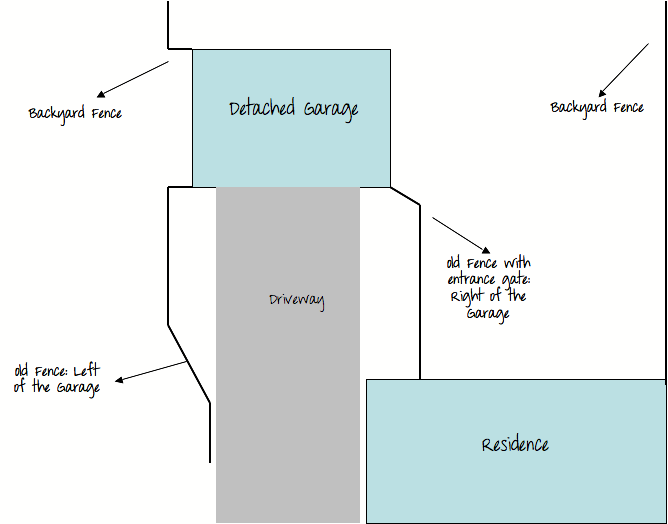 Lastly, we wanted to add a driveway gate to reach across to the residence. To get started, we first took an accurate measurement of the fence line and marked the location of each fence post with white spray paint. Then, we made a quick trip to our local home improvement store for all of the necessary materials. Once we had everything we needed, we started by sinking the new fence posts to give them time to set while we worked on tearing down the old fence. We extended the fence along the left side of the garage, which gave us about 3′ of extra space. Once the posts were secured and set, we began to install the cross beams (horizontally) which will hold the fence panels. We secured these beams with brackets- you can buy them at any hardware store. Although it took us a lot longer than originally expected, we saved a whopping $350.00 in the end! We were able to save money on the cost of materials (using coupons and shopping deals) and by recruiting our friends to save on labor. We were also able to get the driveway gate at 50% off the original price by purchasing one that had been returned. 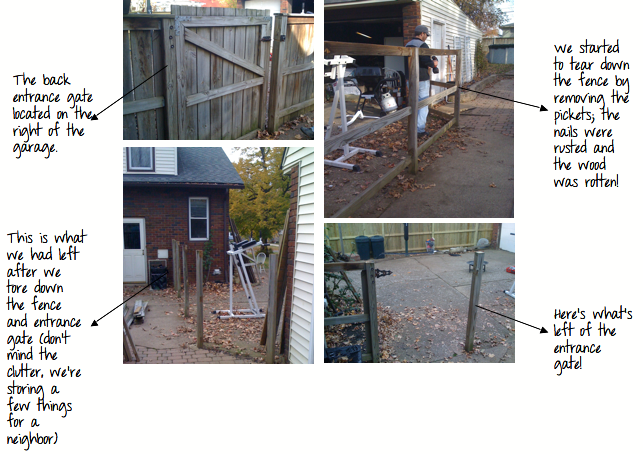 Although the gate wasn’t our exact measurements, we were able to make the needed cuts to fit our fence. I’ll post a detailed list of expenses soon- so check back soon! We’ve managed to significantly increase the usable space in the backyard, including the parking/driveway area and we gained added security with our new driveway gate. Plus, we now have the area to the left of the garage for added storage. I’m very happy with the end result!